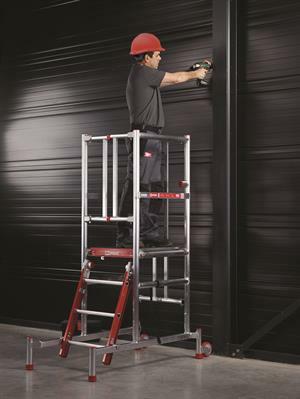 Low Level Work Platforms (LLWPs) were originally developed without a formal specification, and while the majority provided a safe solution to low-level access, there were some aspects that could be improved by specific design criteria. This was addressed with the implementation of PAS 250 in 2012. Since the PAS 250 was converted to the BS 8620 by the British Standards Institution (BSI), safety and performance criteria have been enhanced with a dimensional change to side protection and modifications to two specific tests. As a result of the new standard from the BSI, championed by PASMA our safety has been further improved. PASMA was quick to point out that the transition of PAS 250 to a full British standard does not mean that existing PAS 250 compliant LLWPs are now obsolete. “You can continue to use PAS 250 podiums and there is no necessity to change product immediately. You can introduce the upgrade when the time comes for replacement” said Steve Giblin, HSSEQ Director at Speedy. “Falls from height are still a major killer across industry so any tightening up of standards and improvement in design gets my vote. Speedy offer a comprehensive solution to working at height via our dedicated ‘Intelligent Safety’ programme and we will continue to support PASMA, the HSE, industries and customers to reduce the risk of this as far as we can” continued Steve. The BS 8620 is a new British standard for newly manufactured low-level working platforms, providing a minimum safety and performance criteria. It introduces a dimensional change to the side protection of the equipment and a change to two of the tests that were implemented when PAS 250 came into play. Who is the new standard aimed at? The new standard is aimed at those who are responsible for manufacturing, buying, selling, specifying or using low level work platforms. What equipment is covered by the new standard? What the BS 8620 means for users. You can continue to use PAS 250 compliant equipment, as this equipment has met the benchmark standards for strength, access, stability and rigidity.